Don’t get me wrong. I love having twins. I feel so totally and utterly blessed to have them. But holy heck, it’s hard bloody work a lot of the time. In lots of ways, the first year passed me by in a haze. It was often the littlest things that I found hardest to do on my own with them. Things that my friends with a single baby could manage. 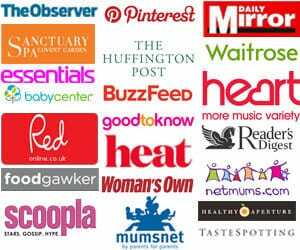 They could go to baby massage classes, take their newborns swimming and go to the supermarket alone. 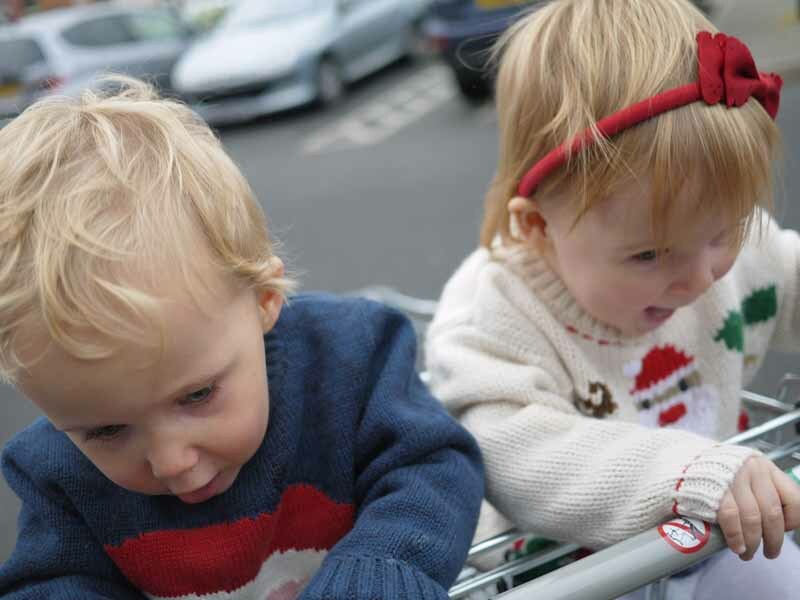 It was almost impossible to take very small baby twins to a supermarket. Getting them in and out of the car was hard work enough (some things don’t change). 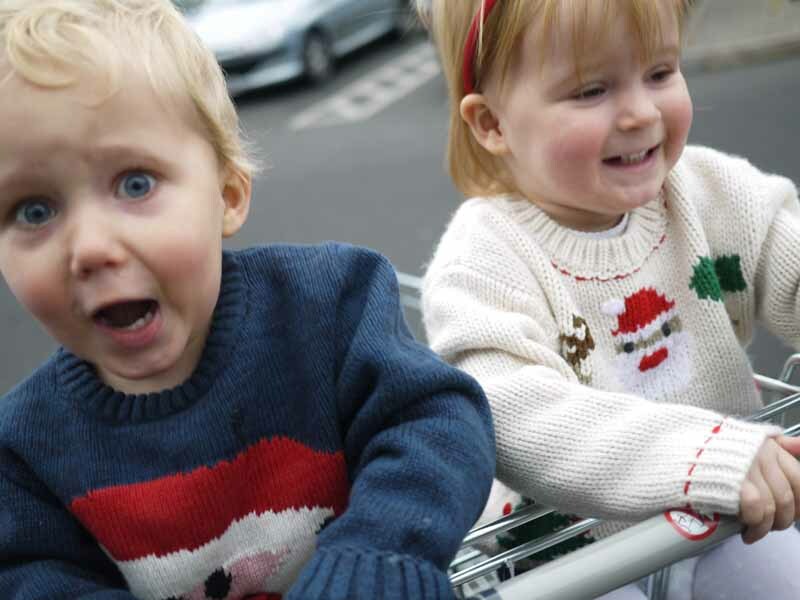 They couldn’t sit up together in a trolley and there’s no such thing as twin crib trolleys. I hadn’t stepped into a supermarket for a very long time. I don’t even like supermarkets, but when you can’t do something, you feel a bit incompetent for not being able to manage it. Then, some time over the summer I became an Aldi convert along with hordes of other middle class mummies. And.. hooray, they have excellent twin trolleys. So things got a bit easier. Every week for the last 6 months, G&H and I have trundled off to the supermarket together. 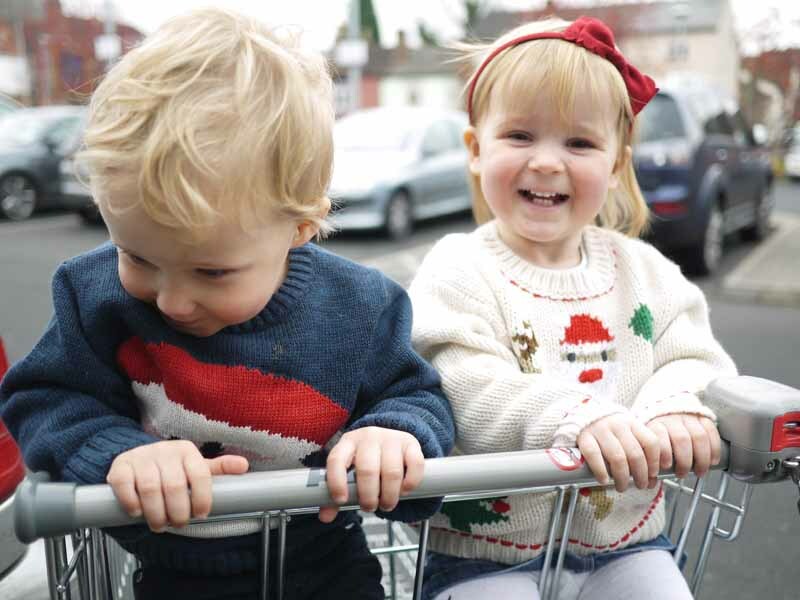 They’d sit in the trolley and wave and smile at people. I’m not sure if the fact that I’ve made a trip to the supermarket an outing makes me a bad mother or not, I don’t care really. They’ve loved it. However, the last couple of weeks have been a bit of a handful. There’s been a lot of fidgeting, hair pulling and squishing each other. I’ve bribed them to sit nicely with boxes of raisins and we’ve left a Hansel & Gretel style trail of them around the shop. When George pulled a cucumber off the shelf and used it as a battering ram against the jars of mincemeat I realised that the golden time of outings to Aldi might be over. So for now, I’m just going to remember those blissful moments of learning that I can handle normal life with twins. The total pleasure in doing the ordinary things with them. My twins are now 6 but I remember those hard times & yet strangely miss them! I miss some bits too Michelle, the baby smell mainly. Not the night feeds! I love George’s face on the bottom photo!! He looks like he’s gearing up to be a little monkey in the shop..! !